Socialmatic‘s dream of producing a physical Instagram camera just got real, thanks to a new agreement that gives the company the right to build the device under the Polaroid brand. So what do you get when you combine the filter-happy, photo-sharing service with one of the most beloved old-school instant cameras? 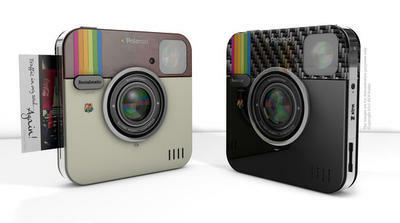 You get this crazy cute device that recasts the Instagram icon as a hardware package (above). Little wonder why this idea looks so droolworthy — one of Socialmatic’s two leads is Antonio De Rosa, a legendary designer from Spain whose ADR Studio was responsible for some of the coolest iPhone concepts (read: fictional imaginings) on the Web. The studio was responsible for the original design, except this time, the device will be powered by the Android OS and actually go into production for a consumer release. We’re not sure if the final version will look exactly like this, but we do know that the digital and film instant camera will feature both Internet connectivity (via 3G and Wi-Fi) and an integrated printer, so users can share images online and in the real world. The snaps that shoot out will have an adhesive backing and a QR code, so users can even follow or track the photo’s whereabouts. Other specs include 16GB built-in storage, SD card slot for expanded storage, a touchscreen, optical zoom, LED flash and four-color ink tanks. That’s quite a bit to cram into such a slim form factor, but Socialmatic has been brainstorming this one for quite a while, so it could have a trick up its sleeve to make it work. At least, we’re sure it won’t sacrifice design in the final product when it hits the market in early 2014. Similar products exist, though they’re bulkier, expensive and/or don’t offer quite the same featureset. Polaroid’s own digital instant film cam, the Z2300, is slim and can print and save digital pics, but it’s $160 and doesn’t include Wi-Fi or an Android-based touchscreen. Samsung’s Galaxy Camera does run Android, but despite the big $500 price tag, it can’t print on the spot. 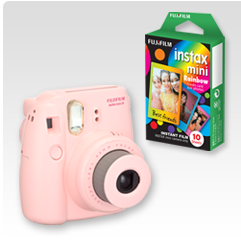 Fujifilm’s Instax Mini 8 can be found for under $100, but isn’t digital, only printing small credit card–sized snapshots. And none of them feature built-in Instagram filters, which alone has a huge fanbase of support. [Addition: It’s worth noting that the Samsung Galaxy Camera, however, can use the third-party app. It’s not integrated, but it is available via Google Play.] Of course, a lot will hinge on the price point, which isn’t known yet. But so far, the Polaroid Socialmatic Camera looks like it has a decent chance of living up to its promise to “fill the gap between virtual and real world.” That’s one area that most cameras, including the ever-popular smartphone camera, still can’t touch. What do you think? Is this hot or not? Let us know if this looks like a gimmicky gadget or a solid offering in the comments.